So to cut the long story short, the Android System UI Tuner is a very useful tool in our android smart phones, but unfortunately, this useful God given tool has been ignorantly neglected by those who have the privilege of using it. Yes i said those who have the privilege because, it is not everyone and every smart phone that is privileged or eligible to make use of the Android System UI Tuner. For you to be eligible, you must make sure you smart phone is running on any of the Android versions from Android 6.0 Marshmallow and above. Anything below that is a No.. No. 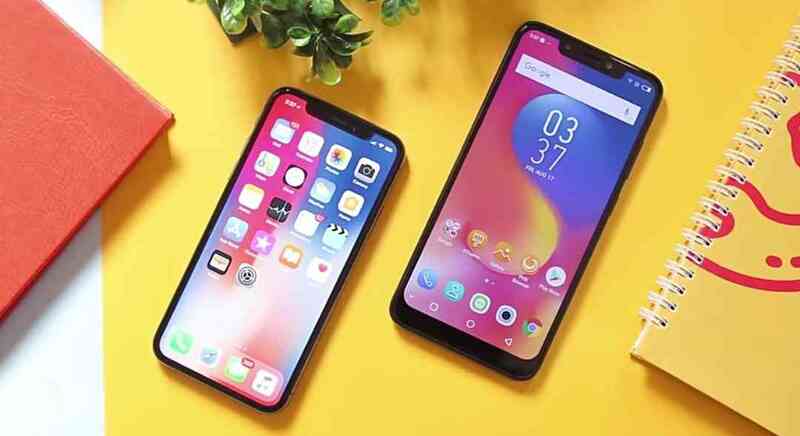 So since we've known the kind of phones that are eligible to use the Android System UI Tuner, let us go a little bit more deeper to see some of the many advantages that you can get with it. So like i said up there, the Android System UI Tuner is really a useful tool that should come pretty handy for those who wants their phone to look and behave different from every other android smart phones out there. For example, you can decide what notifications and alert icons that should show up in your phone's status up there, or you can even decide to add a seconds ticker to the clock in your status bar also.. check the image below. Alright, now so since we've known what the Android System UI Tuner is all above and some of its many advantages, let is get down to business to see how we can set up this good stuff on our Infinix smart phones. So the first step is making sure that your Infinix smart phone is capable and eligible to use the Android System UI Tuner, and how do you do this? by making sure that your smart phone is running on any of the android versions from Android 6.0 Marshmallow and above. I am using an Infinix Zero 4 smart phone here, and it is running on Android 7.0 Nougat. So i guess any phone that came after the Zero 4 should do the same also. So after confirming that your phone is running on the required android version, the next you should do is first activating the System UI Tuner on your phone first, because it doesn't come activated by default. And how do you do this? by ..pulling down you phone's Notifications Drawer, ..then tap and hold unto the little settings icon at the top right hand corner on your phone's screen.. For those using android 8.0 and above, i guess yours should be at the bottom part or the middle of your screen instead. So while holding it, its going to display a little animation which you cannot see because your fingers are covering it, but that's not a problem after all. So just hold it there for let's say up to 10secs or more if you'd like. Now lift your hand from it, and you should see a prompt on your screen that System UI Tuner has been successfully setup on your device. Just go to your phone's settings menu, scroll all the way down and you see that the System UI Tuner has been added to the list of options there. Tap on it, and you are welcome to a whole new world of your phone's customization. The settings are pretty simple and you should get used to them in no time, it only requires you either turning on or turning off a toggle. check the image below. 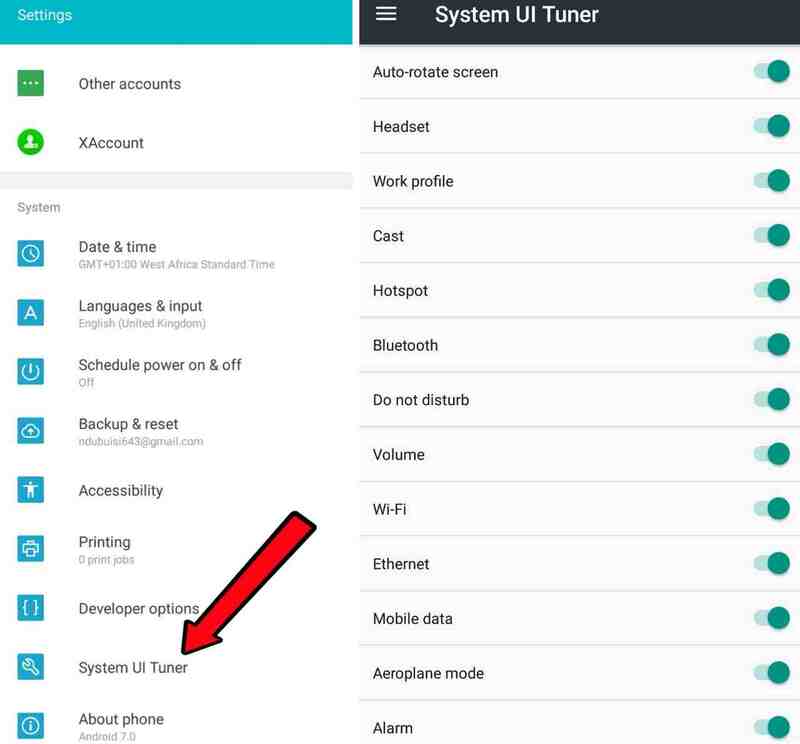 So there you have it guys for the setting up Android System UI Tuner on your Infinix smart phones.. please let us know if you enjoyed reading this so we can be motivated to write the next good article. Don't forget to share this article and subscribe to our newsletter if you've not done so.. i bet you're not gonna regret it. So bye and have a nice day, and catch you on the next one.